Please join the Center for Contemporary Art & Culture in welcoming Meeta Mastani for a lecture entitled Breaking Patterns, on her work as a print/dye artist, design specialist and community development advocate. Meeta Mastani is an internationally known print/dye artist and community development advocate. She works at the intersection of sustainable development, culture, craft, design, arts and retail, helping to generate livelihoods for marginalized individuals and communities. She travels India, working with artisans in the area of folk art, textiles, paper, leather and wood. Since co-founding the sustainable, craft centered development/business, Bindaas Unlimited, she has focused on reinterpreting traditional craft and art for urban and international markets. 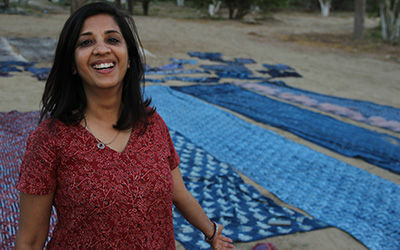 She lives part of the year in rural Rajasthan where she creates contemporary block prints on textiles and T-shirts with ancient printer communities, reviving and expanding the natural dyeing traditions and creating new designs and techniques. An example of her work was recently displayed in a major exhibition of South Asian textiles as the Victoria & Albert Museum-London.